ABSTRACT: Diatonic keyboard tunings in equal temperament, just intonation, meantone and well tempered scales are derived from Pythagorean tuning using algorithms whose operations involve combinations of pure fifths and syntonic commas. Graphic diagrams of the line of fifths are used to show the harmonic and mathematical relationships between common tunings and temperaments. Four modes of just intonation are derived from Pythagorean tuning by an algorithm that narrows each major third by one syntonic comma. Equal temperament is approximated with imperceptible error by algorithms that narrow Pythagorean and justly tuned enharmonic intervals by one or more syntonic commas. [1.1] This article describes algorithms that map the traditional harmonic tunings and temperaments for the keyboard: Pythagorean tuning, equal temperament, just intonation, and historical variations on meantone temperaments. Keyboard tuning is used because it has been worked out in detail over hundreds of years and is understood to give a reasonable approximation of the pitch choices made by performers on instruments without fixed pitches. I have excluded analysis of multiple divisions of the octave into more than twelve notes because they were not commonly used temperaments. Working from the chain of fifths, we will demonstrate how the intervals in any tuning or temperament can be mapped from Pythagorean tuning by algorithms that combine pure fifths and syntonic commas. (1) The algorithms that map the tunings and temperaments into one another are not purely mathematical, but are derived from the harmonic structure of the chain of fifths and enharmonic relationships between notes. [1.2] This article is not concerned with generating diatonic scale tuning from prime numbers or otherwise deriving its form from physical or mathematical principles. We will use the historic definition of a diatonic scale as two tetrachords plus one additional tone that completes the octave. The diatonic octave is divided into five whole tones and two semitones in all tunings and temperaments. The convention of assigning letter names to notes in a 12-note chromatic keyboard for diatonic scales will be observed. The chain of fifths will be introduced and used as the defining feature common to all scales without initially assuming any particular tuning. [1.3] Several modern theorists, including Mark Lindley(2) and Easley Blackwood(3) have applied algebraic techniques in describing the tonal relationships which form traditional diatonic scales. Others have developed diagrams to compare the differences in pitch for a note in various tunings. (4) Although such techniques have their uses, I did not personally find them particularly helpful in visualizing the overall difference between one tuning system or temperament and another. For my own analysis, I prefer to diagram the chain of fifths and use rational fractions to express the size of the intervals. (5) Differences between tuning systems are indicated by placing commas or fractional commas between adjacent fifths. This provides a visual comparison between the separate diatonic tunings and temperaments of a complete scale and makes it easier to demonstrate the mathematical and musical relationships between them. [1.4] Theorists classify tuning systems as either cyclic, generated by a reiterative sequence of fifths, or divisive, tunings that subdivide the octave. (6) Historically, this division is somewhat arbitrary. Euclid and Boethius derived the Pythagorean tuning that we now associate with a sequence of fifths by dividing a monochord into two octaves. (7) Methods based upon the overtone series or other systems which attempt to derive just intonation from acoustic phenomena are often considered to be divisive in nature. The typographical diagrams utilized in this article interpret tunings and temperaments in terms of the line of fifths. [2.1] It is well known that every diatonic scale can be reordered into a sequence of fifths. For the C-major scale, the sequence of fifths is F–C–G–D–A–E–B, renumbering the notes of the scale in the order 4–1–5–2–6–3-7. This is the sequence of notes produced when one starts with C and then tunes a keyboard alternately down a fourth and up a fifth until the last note of the scale is reached. For consistency of metaphor, I call the sequence of fifths a “chain” in which the fifths are “links,” without assuming any specific tuning system. [2.2] The chain of fifths has its origin at C and extends to the sharp notes on the right and the flat notes on the left. The chain is theoretically endless, neither closing nor repeating, so that each note in the chain is musically unique. (8) Figure 1 shows the central 21 links in the chain, with C at the origin. All the notes in the chain are considered to be within a single octave bounded by two C’s. Since fifths and fourths are inversions, each note is a fifth above the note to its left and a fourth above the note to its right. As a matter of convention, it is useful to consider the links to the right of C to be ascending fifths and the those to the left to be ascending fourths. The same seven letter names repeat themselves over and over in the same invariant sequence of the C-major scale—F–C–G–D–A–E–B—with each repetition augmented by sharps to the right and flats to the left. Any group of six adjacent links defines a major diatonic scale whose tonic note is one link from the left end of the group, and a natural minor scale which starts two links from the right end. Horizontal movement of any six-link group is the equivalent of transposition of the scale into a new key as exemplified by Figure 2. A twelve-note chromatic keyboard commonly contained the notes from E to G , before the acceptance of equal temperament. When all the fifths were pure, the keyboard would be suitable for the diatonic major and minor scales in the keys depicted in Figure 2. Other keys would be unavailable because the required sharp or flat notes would be outside the range of the chain of fifths. [2.3] The chain of fifths can be used to rationally order the harmonic structure of the diatonic scale. 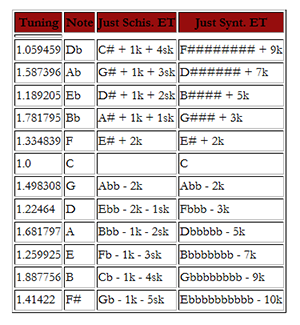 Figure 3 lists the harmonic intervals available on a twelve-note chromatic keyboard for each pairing of links in the chain of fifths. The pairs of notes listed are examples that start with C. Any interval can be horizontally transposed along the chain of fifths. Figure 3 classifies harmonic intervals by the number of links and their direction on the chain of fifths. Each pair of intervals are inversions of one another. Chromatic intervals have more than six links, diatonic intervals have six or fewer. 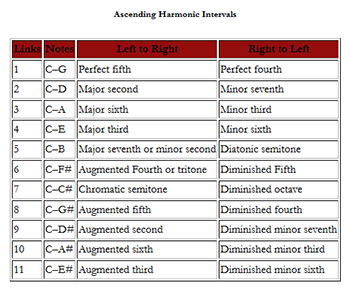 Generally speaking, major intervals and augmented intervals ascend from left to right, while minor intervals and diminished intervals ascend from right to left. The perfect fourth is the only consonant interval that ascends from right to left, which may reflect its harmonic ambiguity. Intervals that ascend to the right from a flat to a natural are always major, such as B –D, a four link ascending major third transposed from C–E. In the same manner, intervals that ascend to the right from a flat to a sharp are considered “augmented,” as in B –D , an 11-link augmented third transposed from C–E . In the opposite direction, intervals that ascend to the left from a sharp to a natural are always minor, as in C –E, a three link minor third transposed from C–E . Intervals that ascend to the left from a sharp to a flat are diminished, as in C –E , a ten-link diminished third transposed from C–E . Each pair of enharmonically equivalent notes is separated by twelve links. It is also well known that the progressions of diatonic harmony correspond to the chain of fifths, but this is a topic which will not be further detailed. [3.1] Tuning the diatonic scale with pure fifths, now known as Pythagorean tuning, was the norm for nearly 2,000 years. The Pythagorean tuning of twelve notes in a standard E –G keyboard is shown in Figure 4. The links are a sequence of powers of 3/2 to the right of C and powers of 4/3 to the left of C. Whenever necessary, the fraction is divided by two to keep the pitch within the compass of a single 2/1 octave. Thus, 3/2 x 3/2 = 9/4. 9/4 is divided by 2, making D = 9/8. Logarithms allow the sequence to be calculated by addition instead of multiplication. In logarithmic measure, each perfect fifth is approximately 702 cents. The tuning of D is equal to 204 cents, obtained by subtracting a an octave of 1200 cents from 702 + 702 = 1404. Since all the links are the same size, the harmonic intervals can be transposed freely. All major seconds are 9/8, all major thirds, 81/64, and etc. The dashes between the letter names of the notes in Figure 4 indicate that the fifths are pure. [3.3] A wolf fifth, “w,” occurs at the end of the line when E has to be used enharmonically because D is unavailable; the “fifth,” which is more precisely a diminished sixth, from G to E (D ) will be too narrow by a Pythagorean comma. Blackwood describes such a narrow fifth as discordant and sounding badly out of place in a scale whose other fifths are pure. (11) It was known as the wolf fifth, because of the howling sound that it made on an organ. [4.1] Equal temperament has been commonly used for the past 150 years to tune pianos and organs and, before that, was used for fretted instruments such as guitars and lutes. Equal temperament flattens the fifths (and sharpens the fourths) by 1/12 of a Pythagorean comma, “p,” as shown in Figure 5. This is just enough to give a true octave from a chain of 12 links. In musical terms, the 12 fifths in the chromatic line are made exactly equal to 7 octaves. As can be seen from Figure 5, the term “equal temperament” only applies to the fifths. The other intervals are not tempered equally with respect to Pythagorean tuning. In Figure 5, the Pythagorean comma is indicated by the upper-case “P” and 1/12 of the Pythagorean comma by the lower-case “p.” The direction of the arrow indicates the ascending harmonic interval. Reversing the arrow would invert the interval and change the sign of the fraction, as illustrated by the fifth (-1/4p) and the fourth (+1/4p). [4.3] We can easily demonstrate from the chain of fifths that equal temperament makes both the tuning and the musical function of each pair of enharmonically equivalent notes equal, using the 12 links from C to B . After subtracting the Pythagorean comma, B becomes the same musical note as C. C can be substituted for B , which is indicated by placing it vertically below B in Figure 6. E is a fifth below B , but since B has been replaced by C, F must be placed below E since F is a fifth below C. The substitutions continue to the left along the top row from B to C until the bottom row is complete from C on the right to D on the left. Figure 6 shows that the two rows created by these substitutions are the same as if the chain of fifths was split into two rows, with the sharp notes above the flat notes. The substitutions derived from equal temperament have made the tuning of the top row identical to that of the bottom row. Equal temperament combines each vertical pair of enharmonically equivalent notes into one single note. (13) This process can be extended out to infinity by vertically stacking each group of 12 notes in rows below D –C and above C–B . Each vertical stack of enharmonic notes will be identical. The profound consequence of equal temperament is that the chain of twelve tempered links absorbs the infinite chain into a single row of 12 chromatic notes that corresponds exactly to the 12 notes-to-the- octave (7 diatonic and 5 chromatic) equally-tempered keyboard. [4.4] Calculating the tuning of an equally tempered scale generates irrational numbers,(14) because the rational fraction that measures the Pythagorean comma must be divided into twelve roots. One equally tempered semitone equals the twelfth root of 2, an irrational number whose value is normally given in a decimal approximation as 1.05946 (100 cents.) The tuning of the chain of equal tempered fifths in six place decimals is given in Figure 7. Using the diagram in Figure 5, the 700-cent logarithmic tuning of an equally tempered fifth is narrower than a 702 cent perfect fifth by 2 cents, 1/12 of the 24-cent Pythagorean comma. The last column in Figure 7 displays this pattern; the pitch of each note in the vertical chain is 700 cents above the note below it before subtracting out the octave. [5.1] In Pythagorean tuning, only the fifths and fourths are tuned as consonant intervals. The thirds and sixths generated by a sequence of perfect fifths are not generally considered consonant by comparison to the most consonant major third which is 5/4, a minor third of 5/6 and their inversions, a major sixth of 5/3 and a minor sixth of 8/5. The diatonic tuning that includes both consonant thirds and pure fifths is known as just intonation. One traditional method of forming a C-major scale in just intonation is to combine consonant tonic, dominant and subdominant triads, F–A–C, C–E–G and G–B–D. This tunes the just diatonic scale shown in Figure 8. The D–A link is narrowed by a syntonic comma indicated by the “k.” Since the other links are pure, the pitch of A, E and B will also be lower than Pythagorean by a syntonic comma. Even though each note has its optimum tuning relative to C, just intonation is a theoretical scale which is unsatisfactory for tuning an instrument with fixed pitch because the narrow D–A results in the unjust intervals shown in Figure 8. The narrow D–A sounds much the same as a Pythagorean wolf fifth. The Pythagorean minor third and its inversion, the major sixth between D and F also sound badly out of place in an otherwise just scale. [5.2] Tuning a chromatic octave in just intonation creates further difficulties since alternate tunings are required for each note. A theoretical scale of just intonation can be calculated for four diatonic major scales in the chromatic octave by replicating the procedure used to form the scale of C-major. A scale of B -major would have triads in which E –G, B –D and F–A were pure major thirds. The pure thirds would be B –D, F–A, C–E in F-major and C–E, G–B and D–F in G-major. Figure 9 shows the two alternative tunings for G, D and A that are required for these four scales. The multiplicity of alternate tunings makes just intonation even more impractical for the normal keyboard with twelve keys to the octave. It can also be seen from Figure 9 that the absolute location of the syntonic comma moves but that its relative location is always on the fourth link of the scale. Each just scale could be considered to be virtually a separate entity whose tuning is fixed by the tuning of the triads that it contains. C is tuned to an arbitrary unit pitch of 1.
from the notes immediately adjacent to it. pitch by 2 to keep it within the same octave. Stop after the 12 notes from E to G have been tuned. The equal temperament algorithm is the same as the Pythagorean algorithm except that the interval in step 2 is 1/12 of a Pythagorean comma narrower than a pure fifth. Although justly tuned scales often have been considered to represent a different species from the Pythagorean or the equally tempered scale, we will show in Figure 10 how an algorithm can be derived that maps Pythagorean tuning into just chromatic scales. [5.4] The scale in Figure 10 has a syntonic comma at every fourth link. This produces a chromatic scale in which the diatonic scale of C-major is just and the maximum number of major thirds are a consonant 5/4. This scale is generated by an algorithm in which (1) the fourth link of a Pythagorean C-major scale is narrowed by a syntonic comma and (2) every fourth link above and below that link is also narrowed by a syntonic comma. The tuning of the just chromatic scale from E to G depicted in Figure 10 corresponds to the tuning given by Rossing for these same 12 chromatic notes within a larger chromatic scale of just intonation from F to B . (15) We can use the graphic diagram in Figure 10 to evaluate the difference between the just and Pythagorean pitch of each note without having to multiply out the 81/80 syntonic comma. In this just chromatic scale, B and E are each a syntonic comma higher in pitch while justly tuned A, E, B and F are each a syntonic comma lower in pitch. Just C and G are lower than Pythagorean by two syntonic commas. Examining Figure 10 demonstrates still more reasons why a chromatic scale of just intonation is unusable on a standard keyboard. Narrowing every fourth link by a comma does not leave all the thirds and fifths consonant. The fifths that are narrowed (which means that the fourths are inversely broadened) by a full syntonic comma are obviously dissonant. Thus, the just chromatic scale has two more dissonant links than a Pythagorean chromatic scale. The wolf fifth from enharmonic D (E ) to G will be narrowed by three syntonic commas. Any group of three adjacent links that does not include a comma will form a Pythagorean minor third and a Pythagorean major sixth. Whole tones in this scale that include a syntonic comma are 10/9, while the other whole tones are in the just and Pythagorean proportion of 9/8. To assess the severe impact of these tuning discrepancies we summarize the most significant consequences when a keyboard tuned in just intonation as in Figure 10 is used to play the six diatonic major scales listed in Figure 2. B -major: fifth of tonic triad narrowed by a syntonic comma. F-major: major fourth broadened by a syntonic comma. C-major: fifth of the II chord narrowed by a syntonic comma. G-major: fifth of the dominant triad narrowed by a comma. D-major: fifth of tonic triad narrowed by a syntonic comma. A-major: major fourth broadened by a syntonic comma. It is, thus, amply clear that just scales with consonant thirds cannot be meaningfully used on a chromatic keyboard. [5.5] Since the scale in Figure 10 was created by an algorithm that narrowed every fourth link by one syntonic comma, one can generate four chromatic modes of just intonation, one for each of the scales shown in Figure 9. These are the only just chromatic scales that are possible when C has the relative tuning of 1, since the pattern of the algorithm repeats after the fourth link. (16) Figure 11 presents the tuning of the four modes of just intonation along a chromatic scale from D to B for a vertical chain of fifths in Pythagorean tuning and the four just chromatic modes in B , F, C, and G. The number of syntonic commas by which each note has been altered from Pythagorean tuning is indicated in parentheses, the pitch of the notes above C being lowered by the number of syntonic commas indicated and the ones below C being raised. The remaining notes are Pythagorean. Figure 11 provides an insight on the relationship between Pythagorean and just tuning. (17) Instead of presenting just intonation as a series of pitches that are independently derived, Figure 11 shows that the pitch of the sharp and flat notes are modified in a regular progression as syntonic commas are sequentially added to or subtracted from Pythagorean tuning. The logarithmic tuning of each note can be easily calculated using the fact that a pure fifth is 702 cents, a pure fourth, its inversion, is 498 cents, and a syntonic comma is 22 cents. As an example, 27/25, the tuning of D in the just G-major mode is 5 links plus 2 syntonic commas left of C: 5 x 498 = 2490 + 44 = 2534. After subtracting 2400, D + 2k = 134 cents. [5.6] F. Murray Barbour listed 22 historical scales of just intonation dating from 1482 to 1776 in his historical survey of tuning and temperament. (18) Barbour defined just intonation more broadly than we have done, including within the concept any 12-note chromatic scale that possessed some pure fifths and at least one pure third. Barbour described a late 18th-century tuning by Marpurg which is the same as Figure 10 as “the model form of just intonation.”(19) Two scales which correspond to the F-major mode shown in Figure 11 were described by Barbour as “the most symmetric arrangement of all.” The first was an early 17th century scale by Salomon de Caus which started with B ; the second was by Mersenne and started on G .(20) An even earlier tuning by Fogliano in the F-major mode starting with E was also included. (21) None of the other tunings are precisely in the form of Figure 11. A complete listing of these historical just tunings is given in Appendix I. [5.7] It is also interesting to compare the actual tuning of notes in Figure 11 with Ellis’s “Table of Intervals not exceeding One Octave” in his appendix to Helmholtz. (22) Figure 11 gives new significance to intervals whose names as given by Ellis imply a diatonic origin. Thus Ellis’s list includes the following varieties of fourths: “acute,” 27/20, a “superfluous,” 25/18 and another “superfluous,” 125/96. Figure 11 shows that the “acute” fourth is the just fourth in the G-major mode, the first “superfluous” fourth is an augmented fourth, F in the F-major and B -major modes, and the second “superfluous” fourth is an augmented third, E , in the C, F and B modes. 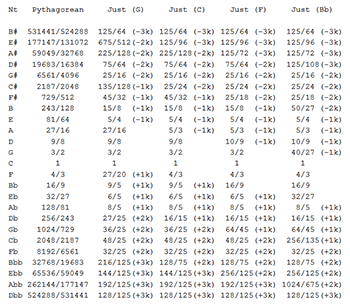 In all, Ellis lists 33 intervals obtained by combining one or more perfect fifths with one or more just thirds, only 3 less than the 36 tunings in Figure 11 that are altered by one or more Pythagorean commas. All but two of Ellis’s 33 intervals are included in Figure 11; one is a well-tempered interval and the other is not part of a chromatic scale in which C is tuned to 1. The complete list of Ellis’s intervals and their notation in terms of Pythagorean tuning and syntonic commas is contained in Appendix II. [5.8] We can now appreciate why the chain of fifths is useful for evaluating the harmonic consequences of alternate tunings of a diatonic scale embedded in a chromatic keyboard. It is not possible to arbitrarily change the pitch of one note without altering its relationship with all other notes in the chromatic space. The interdependence of tuning is not limited to instruments with fixed pitch. For example, a string quartet could not play passages containing a sequence of triads in just intonation without altering the melodic intervals and, possibly the overall level of pitch. (23) The problems of tuning harmonic intervals can only be solved by dynamic ad hoc adjustments of pitch to obtain optimum consonance while preserving the melodic line and stability of pitch. (24) This is one of the reasons why it is so difficult for inexperienced musicians to achieve good ensemble intonation. [5.9] The syntonic comma is not an independent variable; the independent variables are the tuning ratios for the consonant fifth and major third as determined by psychoacoustic measurements, which are 3/2 and 5/4. The syntonic comma, even though it has been known and separately named for two thousand years is merely derived from the difference between the consonant or just major third and the Pythagorean major third generated by four consecutive fifths. However, one would not intuitively expect that this single dependent variable could be used to measure all the differences in tuning between Pythagorean and just scales, including intervals that are not generated by major thirds. (25) The just intonation algorithms provide a coherent framework for this ancient and well respected dependent variable known as the syntonic comma. As was noted above, just intonation and Pythagorean tuning are commonly thought of as different species of tuning. The just intonation algorithms demonstrate that just intonation can more completely be understood in terms of the chain of fifths and syntonic commas than if considered independently. [6.2] The quarter-comma (4q = 1k) narrowing of each link in the chain of fifths is shown in Figure 12, which also depicts the resulting alteration of other intervals from Pythagorean tuning. Compared to Pythagorean tuning, it is evident that the fifths to the right of C are all tuned a quarter-comma flat, while the fourths to the left of C become a quarter-comma sharp. As before, Figures 10 and 12 allow us to measure the difference between the just and meantone scales without using arithmetic. As an example, a mean-tone chromatic semitone is narrowed by 7/4 syntonic commas compared to Pythagorean tuning and 3/4 of a syntonic comma compared to just intonation. For a time, organs were built with more than twelve keys per octave in order to utilize more of the extended chromatic scale. The keys could be split or other devices used to enable the performer to play either note of an enharmonic pair such as A /G or D /C . (29) There was a practice, apparently, of raising or lowering the location of the wolf in the tuning of harpsichords to fit the composition being played at the moment. (30) However, manufacturers refrained from constructing instruments with more than 12 keys per octave and performers refrained from learning how to play such instruments, probably because the standard keyboard was suitable for most uses. As musical development led to the use of more keys outside its central compass, meantone temperament became increasingly impractical. Rational fractions approximating each of the other meantone intervals may be calculated in a similar manner, using the other fractions in the expansion. A chromatic meantone tuning for a keyboard is shown in Figure 13 for a chain of fifths tempered by a quarter-comma (q). (31) Logarithmic values for a meantone scale can be easily calculated by subtracting one-fourth of a syntonic comma (22/4 = 5.5 cents) from every pure fifth. Thus each meantone fifth will be 696.5 cents. [7.1] The term well temperament includes a family of temperaments that modified meantone temperament to eliminate wolves and to expand the range of playable keys by taking advantage of the small difference between the Pythagorean comma and the syntonic comma. The difference between the two commas is an interval of 32805/32786 (2 cents), which is called the schisma. If only four links of a chromatic keyboard scale are tempered by a quarter-comma, with the remainder being tuned pure, the chromatic scale will exceed an acoustic octave by only a schisma and the wolf fifth will be thereby minimized to the point of nonexistence. [7.2] Figure 14 illustrates a simplified form of well temperament in which all but the central four links are Pythagorean and the major thirds vary from just (C–E) to fully Pythagorean (A –C and E–G ). No major triad will be exactly consonant. The wolf fifth between A (G ) and E has been essentially eliminated, and notes which are enharmonic to E , B , F , C and G will differ in pitch only by a schisma. Therefore, use of these notes enharmonically increases the number of available scales from 6 to 11. The tuning for this version of well temperament are given in Figure 15. A number of historical well temperaments were devised that separated the quarter commas by one or more links to improve playability in desired keys. Other temperaments subdivided the syntonic even further into 2/7 and 1/6 commas. The more that the commas were divided and dispersed, the more that well temperament approached equal temperament. [8.1] We will develop and expand upon the method advocated by Kirnberger in the eighteenth century for deriving a scale of equal temperament from Pythagorean intonation. (32) A scale obtained by the first procedure is schismatic equal temperament and a scale obtained by the second procedure is syntonic equal temperament. The tuning of schismatic ET is exactly equal to the tuning for syntonic ET, the only difference being in their algorithms. Both match the tuning of equal temperament to several decimal places as shown in Figure 16. [8.2] Schismatic and syntonic equal temperament is derived by extending a well-tempered scale eleven links to the left and right of C. When the eleventh note to the left of C is raised by one syntonic comma and the eleventh note to the right of C is lowered by one syntonic comma the results are tunings for E and for A that are almost exactly the same as the equally tempered tunings for F and G respectively. E -k ~ F+P-k ~ F+sk ~ F+p. As shown in Figure 5, F+p is the pitch of F in equal temperament. Since the precise value of a schisma is 1.954 cents and 1/12 of a Pythagorean comma is 1.955 cents, the error is only 1/1000 of a cent. One can then obtain decimal tunings for equal temperament by reiterating the proportions for E -1k to a full chromatic chain of 12 links that would exceed an exact octave by a ratio of only 2.000018/2 or 0.012 cents. [8.3] We will now derive and apply two algorithms which map Pythagorean tuning into equal temperament. The algorithm based upon the schisma produces schismatic ET. As with ordinary equal temperament, this procedure equates the tuning of enharmonic pairs, substituting G for A + k, D for E + k + 1sk, and so on. Every 10th link to the left of A + k and to the right of E -1k is tempered by one schisma. The five schismatic notes tuned to the right of A +k are enharmonically equivalent to the notes normally located to the right of G, while the five schismatic notes tuned to the left of E -k are enharmonically equivalent to the notes normally located to the left of F. The steps of the algorithm are as follows. Starting with C, move 10 links to the left to A +1k. Substitute G enharmonically for A +1k. Move 1 link to the right 5 times, adding 1 schisma to the width of each interval. Rename each note enharmonically. Returning to C, move 10 links to the right to E -1k. Substitute F enharmonically for E -1k. Move 1 link to the left 4 times, subtracting 1 schisma from the width from each interval. Rename each note enharmonically. [8.4] The algorithm that produces syntonic equal temperament also starts with the intervals C–A , ten links to the left of C, and C–E , ten links to the right of C. Substituting G, which is enharmonic to A +1k in syntonic ET, and reiterating the process, D in Syntonic ET would be 10 more links to the left of A plus one more syntonic comma, giving D enharmonically equivalent to F +2k. At the other end of the chain, enharmonic B in syntonic ET would be 10 links minus one syntonic comma to the right of E -1k(F), written as B = G -2k. Syntonic ET is based upon substitution of enharmonic pairs just as is equal temperament. The tuning of each note is exactly the same in both syntonic and schismatic ET. The notation and tuning for schismatic and syntonic ET are given in Figure 16. The algorithm for syntonic ET is as follows. Starting with C, move 10 links to the left to A + k. Substitute G enharmonically for A +1k. Reiterate the action 5 more times, adding 1 syntonic comma to the width of each 10-link interval. Rename each note enharmonically. Returning to C, move 10 links to the right of C to E -1k. Substitute F enharmonically for E -1k. Reiterate the action 4 more times, subtracting 1 syntonic comma for each 10-link interval. Rename each note enharmonically. [8.5] We can now go a step further and derive the algorithm that maps just intonation into syntonic ET from the algorithms previously used to map Pythagorean tuning into just intonation. For example, E in the just mode of C-major is equal to Pythagorean E -3k. Adding back the three syntonic commas, E -1k in schismatic and syntonic ET is enharmonically equivalent to E + 2k in the just C-major mode. The algorithm for just schismatic ET parallels the algorithm given in section 8.3, adding back to each interval the number of commas listed in Figure 11. In syntonic ET, B is enharmonically equivalent to G -2k. If the C-mode just scale were extended to G , the Pythagorean tuning would be narrowed by 5 syntonic commas. Replacing the 5 commas, G +3k maps just G into B in just syntonic ET. We have not set out the full just chromatic scale for the 121 links necessary in Figure 11, but it can be done simply by adding 1 syntonic comma for every four links to the left and subtracting 1 syntonic comma for every four links to the right as many times as is necessary. Applying these algorithms in Figure 17 gives scales of just schismatic and just syntonic ET for the C-major scale. [8.6] Of course, neither syntonic nor schismatic ET are precisely equal. They do not merge all enharmonically equivalent notes, as shown by the outer sections of Figure 16 which contains notes from G to F in schismatic ET. The enharmonic value for D is not exactly equal to the value of C as it is in equal temperament and C is not exactly equal to D and B . Therefore, the number of possible notes is still endless and does not collapse to twelve. The divergences between the tunings produced by the two equal temperaments are of no audible or acoustic significance either to the tuning of individual notes or to the overall sound of the temperament. A keyboard instrument tuned to syntonic ET would not sound distinguishable from one tuned with unlikely mathematical perfection to traditional equal temperament. The twelve chromatic links tuned to syntonic ET would have to be replicated nearly 163 times before the divergence in tuning C would exceed even one schisma. [9.1] This article has explored the relations between keyboard tunings based upon the chain of fifths. We began by accepting the historical definition of a diatonic scale embedded in a 12-note chromatic keyboard. We demonstrated that the terms used to name diatonic and chromatic intervals can be rationally ordered according to the number of links between the intervals on the chain of fifths. We then derived algorithms that map Pythagorean tuning into just intonation and equal temperament and map just intonation into equal temperament. Pythagorean tuning and just intonation have traditionally been classified as distinct tuning strategies, while Pythagorean tuning and equal temperament have been related only by the Pythagorean comma. This article has shown that the three tunings can be related using algorithms that utilize combinations of pure fifths and syntonic commas. The numbers in the left hand margin correspond to the number used by Barbour. The table lists the author of the temperament, the date of its publication, the chromatic compass of the tuning on the chain of fifths, and the number of intervals which are pure or are altered by one or more commas, starting at the left end of the chain. 81. Ramis, 1482. Ab-F#  Ab-G, 8=0, 4=-1k. 82. Erlangen, 15c. Ebb, Bbb, Gb-B, 2=+1k, 8=0, 2=-1. 83. Erlangen revised, Eb-G#, 7=0, 3=-1k. 84. Fogliano 1529     Eb-G#, 1=+1k, 4=0, 4=-1k, 3=-2k. 85. Fogliano 1529     Eb-G#, 2=+1k, 4=0, 3=-1k, 3=-2k. This chart lists the intervals identified by Ellis as being formed from pure fifths and major thirds. It provides the inverted proportions used by Ellis and his name for the interval along with the Pythagorean equivalent of the interval from Figure 11. F -1k was not part of Figure 11 because it is not included in a scale in which C = 0. G -1k is a well-tempered interval from Figure 14. The remainder of the intervals are from Figure 11. 1. The syntonic comma is defined as the difference between the Pythagorean tuning and just tuning of the major third. The difference between the just third (5/4) and the Pythagorean third (81/64) is 81/80, calculated as follows: 81/64 x 4/5 = 81/16 x 1/5 = 81/80. The syntonic comma is also the difference between the Pythagorean and just tunings for all diatonic intervals other than the fourth and fifth, which are the same in both tunings. The reason for the repeated appearance of the syntonic comma will be apparent from the discussion of the four modes of just intonation in section 5. 2. Mark Lindley and Ronald Turner-Smith, “An Algebraic Approach to Mathematical Models of Scales,” Music Theory Online 0.3 (1993), which is a commentary based upon their book, Mathematical Models of Musical Scales (Bonn: Verlag fuer Systematische Musikwissenschaft, 1993). 3. Blackwood, The Structure of Recognizable Diatonic Tunings, (Princeton: Princeton University Press, 1985). 5. Intervals measured by rational fractions can be converted into cents using the following approximate values: octave = 1200 cents, perfect fifth = 702 cents; Pythagorean comma = 24 cents; syntonic comma = 22 cents. 6. See Lindley and Turner-Smith, “An Algebraic Approach,” paragraph 4. 7. In modern terminology, dividing the string in half gives two octaves, in thirds gives a fifth and an eleventh, and in fourths gives a fourth, octave and double octave. The other diatonic notes are then determined by calculating intervals of a fifth from these intervals. This produces two diatonic octaves in Pythagorean tuning. 8. Perfect fifths do not combine to produce a perfect octave. The nth fifth in a sequence of n fifths is defined mathematically by the expression (3/2)(n), which can never be an exact multiple of 2 since every power of 3 is an odd number. The mathematical proof that no sequence of fourths can ever produce an octave is less obvious since every even number can be expressed as a fraction with an odd denominator, and every power of 3 can be associated with an infinite sequence of even numbers, such as 18/9, 36/9, . . . ; 162/81, . . . , etc. However, an intuitive musical proof can be deduced from the fact that fourths and fifths are inversions of one another. No sequence of fourths can generate an octave because the inverse sequence of fifths can never do so. 9. In logarithmic measure, a perfect fifth is 702 cents. Therefore twelve perfect fifths equals 8424 cents while seven octaves is 8400 cents. The difference, the Pythagorean comma, is therefore equal to 24 cents. 10. Euclid (attrib. ), Section of the Canon, in Barker, Greek Musical Writings, vol. 2 (Cambridge: Cambridge University Press, 1989), 199. Twelve links on the chain of fifths can be interpreted as 12 fifths, 6 whole tones, 4 minor thirds and 3 major thirds. Thus, the Pythagorean comma is also equal to the difference between three major thirds or four minor thirds and an octave. In Pythagorean tuning, a Pythagorean comma is the interval between any two notes separated by 12 links on the chain of fifths. 11. Blackwood, Recognizable Diatonic Tunings, 58. 12. The development of the 12-tone school of composition was a logical consequence of accepting the 12-semitone model of equal temperament in place of a chain of harmonic fifths. 13. These stacked rows appear in Helmholtz’s On the Sensations of Tone (London: Longman, 1885; New York: Dover, 1954; orig., 4th ed., Braunshweig: Verlag von Fr. Vieweg u. Sohn, 1877), 312, where it is used to illustrate the enharmonic relation between notes in Pythagorean intonation. 14. An irrational number, such as pi or the square root of two, is one that cannot be expressed as the ratio of two integers. An irrational number includes a nonterminating decimal written to the number of decimals needed for practical accuracy. 15. Rossing, The Science of Sound (Reading, Mass: Addison Wesley, 1982), 161. This is a general textbook on acoustics. 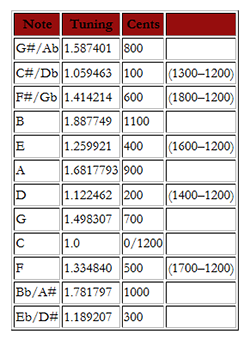 Rossing’s chart lists the equally-tempered, just and Pythagorean tunings for a 22-note chromatic scale in cents and decimals. The just scale corresponds to the “C” scale in Figure 10. 17. The algorithm used to construct just chromatic scales can be used to illustrate why intervals generated by the prime 7 cannot be systematically included in diatonic keyboard tunings. Pleasant sounding intervals can include sevens. Examples which are commonly cited are a 7/4 minor seventh, a 7/5 diminished fifth, both of which are part of a diminished seventh chord in which the notes C, E, G, B are in the proportion of 4:5:6:7, or 1:5/4:3/2:7/4. A single scale in which these intervals are used can be contrived. However, temperaments based on 7’s or factors of 7 do not produce a usable family of chromatic keyboard scales from the chain of fifths, which would have the desired ratios for the diminished seventh chord. The “septimal” comma which produces a 7/4 minor seventh and an 8/7 major second on the second link of the chain of fifths is 64/63 (27 cents). Therefore, reiteration of the septimal comma, “s”, in an algorithm which tunes every minor seventh to 7/4 produces two modes of septimal chromatic scales in which E is 64/49, not the desired 5/4. These septimal modes are worse than the just modes because the septimal comma is broader than the syntonic comma by five cents. The deviation from just intonation is further aggravated because septimal commas increase the pitch of notes to the right of C and decrease the pitch of notes to the left of C, contrary to the action of the syntonic comma. Thus, compared to just intonation, the pitch of notes to the right of C will be painfully sharp and notes to the left will be dismally flat. For example, the major third necessary for the diminished seventh chord will be 2s+1k (76 cents) broader than in a just scale while the minor sixth will be 2s + 1k (49 cents) narrower. 18. Barbour, Tuning and Temperament: A Historical Survey (East Lansing, Michigan: Michigan State College Press, 1953), 90–102. 22. Helmholtz, On the Sensations of Tone, 453. A similar list of “Extended Just Tuning” is found in Blackwood, Recognizable Diatonic Tunings, 116–119. 23. Blackwood, Recognizable Diatonic Tunings, 74, demonstrates that in a common progression of C-major triads from II to V, just intonation would require that D as the root of the II chord be one syntonic comma lower in pitch than D as the fifth of the V chord. In The Science of Musical Sound (Scientific American Books, 1983, 67), John Pierce shows a five chord progression, I, IV, II, V, I, in which the just tuning of C drops by a syntonic comma from the first chord to the last. 24. It is for this reason that Lloyd in his article on Just Intonation in the 1954 Grove Dictionary adopted the position that instruments without fixed pitch and vocalists use a flexible scale in which the size of the intervals vary according to the context and part of the reason that Lindley and Turner-Smith introduced the concept of “leeway” into their algebraic tuning theory. 25. Inspection of the chain of fifths tells us that a major third can only generate one-quarter of the infinite series of chromatic notes that are generated by the fifth. This is why the tuning of the major third is a subsidiary factor in the generation of diatonic scales. 26. Barbour, Tuning and Temperament, 26. 27. Grove’s Dictionary of Music and Musicians (1954), “Temperaments” (380). 28. Dart, The Interpretation of Music (New York: Harper & Row, 1963), 47. 29. Barbour, Tuning and Temperament, 108–9. Since the first reference to split keys found by Barbour goes back to 1484, this device must have been used for both Pythagorean and meantone tunings. 30. Grove’s Dictionary of Music and Musicians, “Temperaments” (379). Barbour states that these approximations “check closely with numbers obtained by taking roots,” with the G being off by 0.000003. Barbour, Tuning and Temperament, 29. 32. Barbour, Tuning and Temperament, 64. The syntonic comma is defined as the difference between the Pythagorean tuning and just tuning of the major third. The difference between the just third (5/4) and the Pythagorean third (81/64) is 81/80, calculated as follows: 81/64 x 4/5 = 81/16 x 1/5 = 81/80. The syntonic comma is also the difference between the Pythagorean and just tunings for all diatonic intervals other than the fourth and fifth, which are the same in both tunings. The reason for the repeated appearance of the syntonic comma will be apparent from the discussion of the four modes of just intonation in section 5. Mark Lindley and Ronald Turner-Smith, “An Algebraic Approach to Mathematical Models of Scales,” Music Theory Online 0.3 (1993), which is a commentary based upon their book, Mathematical Models of Musical Scales (Bonn: Verlag fuer Systematische Musikwissenschaft, 1993). Blackwood, The Structure of Recognizable Diatonic Tunings, (Princeton: Princeton University Press, 1985). Intervals measured by rational fractions can be converted into cents using the following approximate values: octave = 1200 cents, perfect fifth = 702 cents; Pythagorean comma = 24 cents; syntonic comma = 22 cents. See Lindley and Turner-Smith, “An Algebraic Approach,” paragraph 4. In modern terminology, dividing the string in half gives two octaves, in thirds gives a fifth and an eleventh, and in fourths gives a fourth, octave and double octave. The other diatonic notes are then determined by calculating intervals of a fifth from these intervals. This produces two diatonic octaves in Pythagorean tuning. Perfect fifths do not combine to produce a perfect octave. The nth fifth in a sequence of n fifths is defined mathematically by the expression (3/2)(n), which can never be an exact multiple of 2 since every power of 3 is an odd number. The mathematical proof that no sequence of fourths can ever produce an octave is less obvious since every even number can be expressed as a fraction with an odd denominator, and every power of 3 can be associated with an infinite sequence of even numbers, such as 18/9, 36/9, . . . ; 162/81, . . . , etc. However, an intuitive musical proof can be deduced from the fact that fourths and fifths are inversions of one another. No sequence of fourths can generate an octave because the inverse sequence of fifths can never do so. In logarithmic measure, a perfect fifth is 702 cents. Therefore twelve perfect fifths equals 8424 cents while seven octaves is 8400 cents. The difference, the Pythagorean comma, is therefore equal to 24 cents. Euclid (attrib. ), Section of the Canon, in Barker, Greek Musical Writings, vol. 2 (Cambridge: Cambridge University Press, 1989), 199. Twelve links on the chain of fifths can be interpreted as 12 fifths, 6 whole tones, 4 minor thirds and 3 major thirds. Thus, the Pythagorean comma is also equal to the difference between three major thirds or four minor thirds and an octave. In Pythagorean tuning, a Pythagorean comma is the interval between any two notes separated by 12 links on the chain of fifths. Blackwood, Recognizable Diatonic Tunings, 58. The development of the 12-tone school of composition was a logical consequence of accepting the 12-semitone model of equal temperament in place of a chain of harmonic fifths. These stacked rows appear in Helmholtz’s On the Sensations of Tone (London: Longman, 1885; New York: Dover, 1954; orig., 4th ed., Braunshweig: Verlag von Fr. Vieweg u. Sohn, 1877), 312, where it is used to illustrate the enharmonic relation between notes in Pythagorean intonation. An irrational number, such as pi or the square root of two, is one that cannot be expressed as the ratio of two integers. An irrational number includes a nonterminating decimal written to the number of decimals needed for practical accuracy. Rossing, The Science of Sound (Reading, Mass: Addison Wesley, 1982), 161. This is a general textbook on acoustics. Rossing’s chart lists the equally-tempered, just and Pythagorean tunings for a 22-note chromatic scale in cents and decimals. The just scale corresponds to the “C” scale in Figure 10. The algorithm used to construct just chromatic scales can be used to illustrate why intervals generated by the prime 7 cannot be systematically included in diatonic keyboard tunings. Pleasant sounding intervals can include sevens. Examples which are commonly cited are a 7/4 minor seventh, a 7/5 diminished fifth, both of which are part of a diminished seventh chord in which the notes C, E, G, B are in the proportion of 4:5:6:7, or 1:5/4:3/2:7/4. A single scale in which these intervals are used can be contrived. Barbour, Tuning and Temperament: A Historical Survey (East Lansing, Michigan: Michigan State College Press, 1953), 90–102. Helmholtz, On the Sensations of Tone, 453. A similar list of “Extended Just Tuning” is found in Blackwood, Recognizable Diatonic Tunings, 116–119. Blackwood, Recognizable Diatonic Tunings, 74, demonstrates that in a common progression of C-major triads from II to V, just intonation would require that D as the root of the II chord be one syntonic comma lower in pitch than D as the fifth of the V chord. In The Science of Musical Sound (Scientific American Books, 1983, 67), John Pierce shows a five chord progression, I, IV, II, V, I, in which the just tuning of C drops by a syntonic comma from the first chord to the last. It is for this reason that Lloyd in his article on Just Intonation in the 1954 Grove Dictionary adopted the position that instruments without fixed pitch and vocalists use a flexible scale in which the size of the intervals vary according to the context and part of the reason that Lindley and Turner-Smith introduced the concept of “leeway” into their algebraic tuning theory. Inspection of the chain of fifths tells us that a major third can only generate one-quarter of the infinite series of chromatic notes that are generated by the fifth. This is why the tuning of the major third is a subsidiary factor in the generation of diatonic scales. Barbour, Tuning and Temperament, 26. Grove’s Dictionary of Music and Musicians (1954), “Temperaments” (380). Dart, The Interpretation of Music (New York: Harper & Row, 1963), 47. Barbour, Tuning and Temperament, 108–9. Since the first reference to split keys found by Barbour goes back to 1484, this device must have been used for both Pythagorean and meantone tunings. Grove’s Dictionary of Music and Musicians, “Temperaments” (379). Barbour, Tuning and Temperament, 64.